Gen Con, one of the largest board gaming conventions in the world has extended their partnership with Indianapolis. The new one-year extension now has the contract continue through 2021. Besides simply extending the contract by a year, Gen Con will now have the option to renew the contract annually, instead of committing to a set number of years with the city. The city of Indianapolis has fought hard to retain Gen Con. In 2015 the convention threatened to move if the state’s governor, who is now the Vice President of the United States, Mike Pence, signed controversial “religious freedom” legislation. Critics of the bill, including Gen Con, said that the legislation would allow business to refuse service to people, which is an act of discrimination. At the time Gen Con had a contract with Indianapolis through 2020, and this newest agreement will extend their stay in the city until 2021. The whole city really gets into the board gaming spirit when Gen Con is in town. Restaurants all around the convention center re-theme their menus, and there are a ton of events happening around the clock. In 2016, Gen Con recorded a unique attendance record of more than 61,000 people, with a turnstile attendance of 201,852. 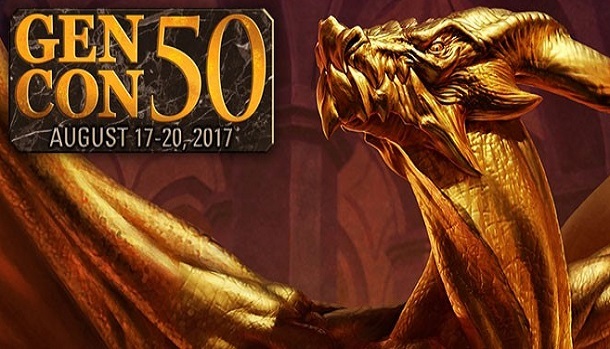 This year Gen Con is celebrating their 50th anniversary.